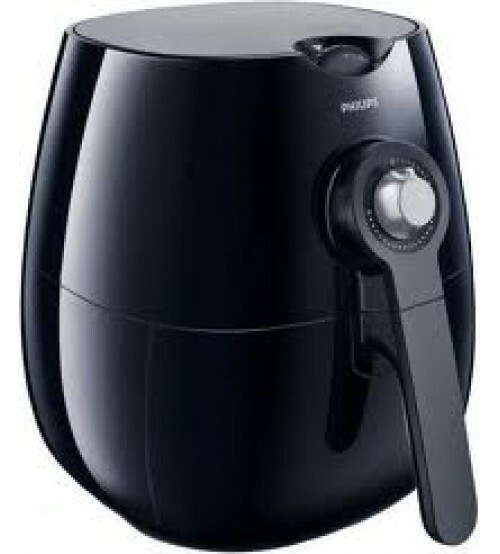 Philips HD9220 Airfryer's unique Rapid Air technology enables you to fry, bake, roast and grill, the tastiest snacks and meals with little oil or no oil.Air fryer is equipped with air filter that reduces the smell created while cooking.You can put the detachable, non-stick food basket of this kitchen appliance in your dishwasher to clean it quickly and efficiently.Equipped with an inbuilt timer, this air fryer lets you pre-set the cooking time for up to 30 minutes. It also has an auto-shut off feature that lets you know when your food is done cooking with a sound indicator. The temperature controlling feature lets you set the right temperature up to 200 degrees for optimum cooking results.This kitchen appliance runs on 1425 W of power and can cook up to 800 gms of raw ingredients in one go.